For days, the mainstream media has been devoted to promoting the protest of 20 white nationalists in D.C. showing their relentless attempt to push divide on Americans. 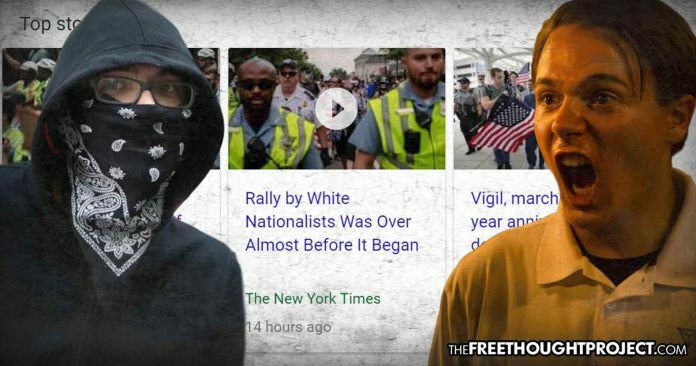 Washington, D.C. — Approximately 20 white nationalists rallied in the nation’s capital over the weekend on the anniversary of the face off in Charlottesville, Virginia and the media has incessantly devoted round the clock coverage of it for the last week. Why is that? In the days leading up to the protest, the mainstream media essentially acted as advertisement for the tiny group of white nationalists who’s lackluster turnout would have likely gone entirely unnoticed otherwise. The divide was stoked so much that hundreds of counter protesters showed up ready for battle only to be sadly disappointed that they had no one to scream at. While it is certainly noble to protest racism and hate—as the majority of the 40 anti-racism groups did over the weekend—their response was anything but organic. Thanks to the heavy media coverage and fear that “white nazis” would be gathering in D.C., hundreds of counter-protesters were able to prepare and show up for the rally. In fact, the only significantly large aspect to the white nationalist’s protest was the media coverage it received. One would have thought that half the country was about to face off with the other half in some race war of the century. But, in reality, it was much different. What this illustrates is that racism in this country is dying, but the media appears to be fervently attempting to keep it alive. As David Marcus pointed out in a hard hitting piece for the Federalist, white people are being asked—or pushed—to take stock of their whiteness and identify with it more. This is a remarkably bad idea. The last thing our society needs is for white people to feel more tribal. The result of this tribalism will not be a catharsis of white identity, improving equality for non-whites. It will be resentment towards being the only tribe not given the special treatment bestowed by victimhood. We are now seeing the inevitable result of such irresponsible practices of race shaming. As whites — who may have been on the verge of racism — sat back and watched the mainstream media chastise their skin color, they eventually reached a tipping point. Charlottesville was an example of what happens when this state-sponsored and media supported divide is pushed on the populace. Once the radical left, who’ve been taught over the past several years to despise ‘whiteness’, saw the epitome of said ‘whiteness’ take over the ‘white’ house, the perfect storm was created. The ranks of Antifa and similar groups — just like their counterparts in the white nationalists — also began to swell. When white nationalists and Antifa or similar groups, meet face to face, violence is now inevitable. These two factions have become a literal representation of the divide and conquer tactics employed through the left/right paradigm. Luckily, however, as the laughable turnout in D.C. illustrates, they are still having a hard time creating this divide. People simply want to get along and these battles covered on the mainstream media of white nationalists and leftist radicals brawling in the streets are highly uncommon. These groups represent a very small minority of society, yet the media devotes hundreds of hours of coverage to them. Where was CNN, MSNBC, FOX News, et. al. when veterans led a peaceful protest in New Orleans last month to raise awareness for the growing epidemic of suicides? Or, where is the media coverage for the Antiwar protest that is set to take place in Chicago this month? The divide and conquer tactics by the mainstream couldn’t be more evident. Fortunately, however, Americans, for now, appear to be rejecting it. It is up to us to continue to counter the narrative and push for peace—even when it’s with people with whom we disagree. For peace is not only the desired result, but as the great Dr. King said, it is the path on which we get there.